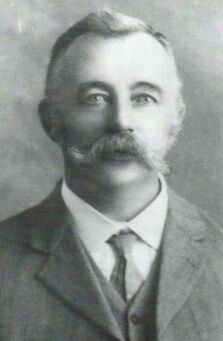 James Christie, Mayor of Mackay 1910,1911. Died: 22 January 1924 (Mackay, Queensland) aged 62 years. Parents: John CHRISTIE and Annie RIDDOCK. Marriage: 10 February 1886 (Mackay, Queensland) to Janet MILNE. James Christie emigrated to Australia and arrived aboard the ship "Hannah Landells" arriving in Mackay on 12th September 1883, together with his brother John and sister Jane. While on the ship the Captain recognised his capabilities and he was appointed Sergeant at Arms and so was responsible for law and order. Perhaps this experience was the precursor to his involvement in the local voluntary Militia group, which he led out to Longreach in 1891 and was credited with helping to settle the Shearer's Strike of that time. He was rewarded with an ornate gilded lock which occupied pride of place in the family home "Rothiemay", Brisbane Street, for many years, and now rests with the Museum at Barcaldine. James Christies was employed at Marsh and Webster Ltd. He was appointed to the first Board of Directors in 1900 and was with that leading emporium until is untimely death on 22nd January 1924, which occurred at Walkerston while returning from a business trip to the country. 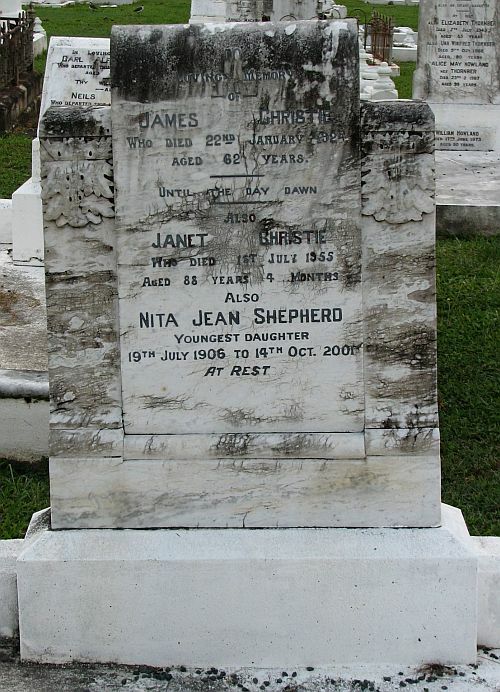 Headstone of James Christie, Mackay Cemetery. James Christie was Mayor of Mackay for 2 years in 1910 and 1911 and is credited with having a lot to do with the construction of the Town Hall, opened in 1912. He was also President of the Chamber of Commerce and President of the Traders' Association. He married Janet Milne at Mackay on 10th February 1886 and together they had a family of 10 children. Together the family became staunch, lifelong members of St. Paul's Presbyterian Church. James was an Elder of the Kirk, Janet, Church Organist and with their daughters in particular, were involved in every facet of church life. James was Captain and Instructor of the first Boy's Brigade about 1897. His Christian principles permeated his whole life. Mackay Cemetery Burial Register, Mackay Branch Genealogical Society of Qld. Mackay Cemetery Monumental Inscriptions, Mackay Branch Genealogical Society of Qld. Queensland Births Deaths and Marriages, Deaths 1920-1924, Microfische No. 002, Page No. 282, Registration No. 1924 / 000653.
page created 15 July 2003.
last updated 17 July 2017 .